Normal respiration is controlled by complex physiological pathways in the body. A respiratory failure can prove fatal and can cause death if untreated. In this article, normal physiology of respiration, types, pathophysiology, and treatment of respiratory failure will be discussed in detail. Respiratory dysfunction resulting in failure of gas exchange i.e. decrease in arterial oxygen tension, PaO2, lower than 60 mm Hg (hypoxemia). It may or may not accompany with hypercapnia, a PaCO2 higher than 50 mm Hg (decreased CO2 elimination). In normal individuals, the “alveolar” oxygen tension PAO2 is maintained close to 100 mmHg, while alveolar carbon-dioxide tension PACO2 is maintained close to 40 mmHg. There is a small difference of 5-10 mmHg between “Alveolar (A)” and “arterial (a)” oxygen tension because around 2 % of the systemic cardiac output bypasses the pulmonary circulation (physiologic shunt) and is not oxygenated. 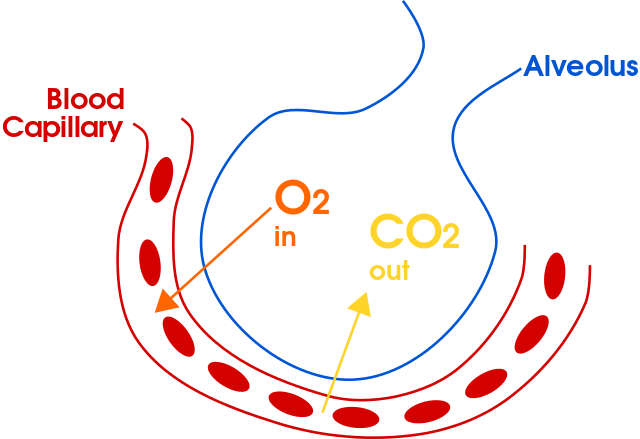 The resulting mixing of a small amount of deoxygenated blood makes the PO2 of arterial blood (PaO2) slightly lower than that of alveolar air (PAO2). Normal A-a gradient is about < 10 mmHg. If A-a gradient is normal, it means there is no defect in the diffusion of gases. The A-a gradient helps to outline the different causes of respiratory failure. 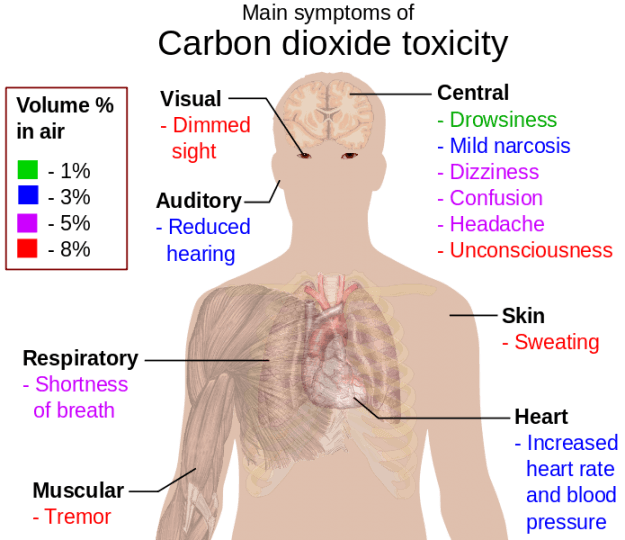 At steady state, the rate of carbon dioxide production within the body is constant. The PACO2 depends on and is ‘inversely proportional’ to the ventilation, so the increased ventilation will lead to decreased PACO2 and decreased ventilation will cause increased PACO2. PACO2: Alveolar PCO2 R: Respiratory exchange ratio. It usually occurs due to hypoventilation. Respiratory failure may be further classified as either acute or chronic onset. Acute respiratory failure occurs within minutes and hours and is usually an emergency. It is characterized by life-threatening changes in arterial blood gases and the acid base status of the body. E.g. tension pneumothorax, pulmonary embolism, acute respiratory distress syndrome, anaphylactic reactions. Chronic respiratory failure occurs gradually over weeks and months. It is less dramatic and not always readily apparent. The kidneys usually compensate and normalize the acid-base status of the body by altering bicarbonate and acid excretion. Polycythemia may also occur. E.g. chronic obstructive pulmonary disease, pneumoconiosis. Hypoxemia is a decrease in arterial PO2, while hypoxia is decreased oxygen delivery to the tissues. Patient may develop hypoxia in the presence of normal PaO2, as in cases of carbon-monoxide poisoning or decreased hemoglobin (anemia). The minute ventilation depends on the respiratory rate and the tidal volume, which is the amount of inspired air during each normal breath at rest. The normal respiratory rate is about 12 breaths per minute and the normal tidal volume is about 500 mL. Therefore, the minute respiratory volume normally averages about 6 L/min. Hypoventilation occurs when there is decrease in the respiratory rate and/or tidal volume, so that decreased amount of air is exchanged per minute. There will be decreased oxygen entry within the alveoli and the arteries leading to decreased PaO2. As already described, the PaCO2 is inversely proportional to the ventilation. Hence, the hypoventilation will lead to increased PaCO2. The alveolar-arterial gradient will be normal and less than 10 mmHg as there is no defect in diffusion of gases. In these cases, increasing the ventilation and/or increasing the oxygen concentration will correct the deranged blood gases. In diffusion impairment, there is a structural problem within the lung. There may be decreased surface area (as in emphysema), or increased thickness of alveolar membranes (as in fibrosis and restrictive lung diseases) that impairs the diffusion of gases across the alveoli leading to increased alveolar-arterial gradient. In increased A-a gradient, the alveolar PO2 will be normal or increased, but arterial PO2 will be decreased. The greater the structural problem is present, the greater the alveolar-arterial gradient will be. Since diffusion of gases is directly proportional to the concentration of gases, therefore increasing the concentration of inhaled oxygen will correct PaO2 but the increased A-a gradient will be present as long as the structural problem is present. In pulmonary shunt, also known as right-to-left shunt, the venous deoxygenated blood from the right side enters the left side of the heart and systemic circulation without getting oxygenated within the alveoli. 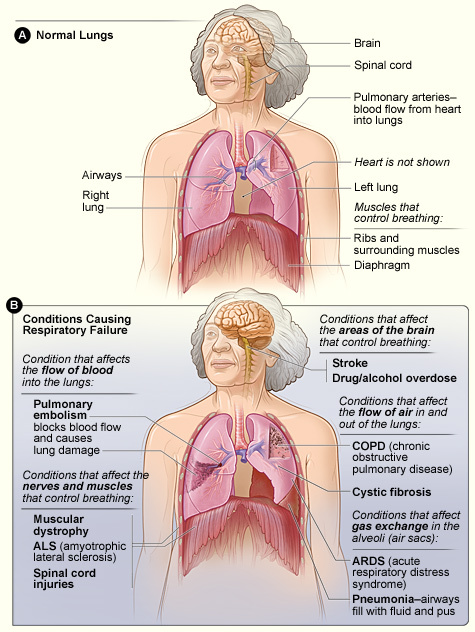 In simple words, shunt refers to “normal perfusion, poor ventilation.” The lungs are having normal blood supply, but ventilation is decreased or absent that fails to exchange gases with the incoming deoxygenated blood. The ventilation/perfusion ratio is or near to zero. For example, atelectasis and cyanotic heart diseases. In atelectasis, the collapsed lung is not ventilated and blood within that segment fails to oxygenate. In cyanotic heart diseases, the blood from right side bypasses (shunts) the lungs and enter the left side, causing hypoxemia and cyanosis. The A – a gradient is increased as deoxygenated blood enters the arterial (systemic) circulation decreasing the arterial oxygen tension, PaO2. Since venous blood does not oxygenate in the pulmonary shunt, therefore increasing the oxygen concentration does not correct the hypoxemia. 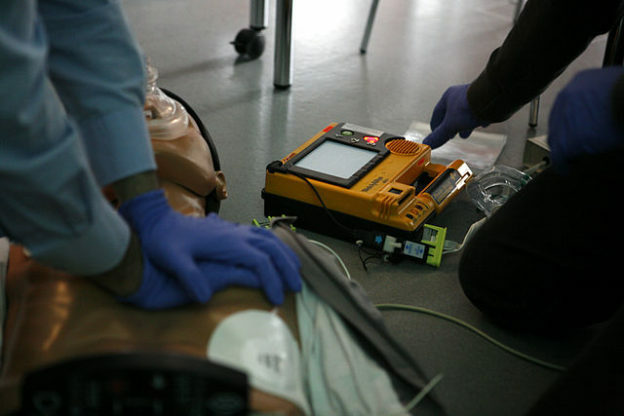 The blood will bypass the lungs, no matter how much increased oxygen concentration is used. This failure to increase PaO2 after oxygen administration is a very important point and helps to differentiate from the impaired diffusion and other causes of hypoxemia that correct with the supplemental oxygen. It is the ratio of alveolar ventilation (V) to pulmonary blood flow (Q). 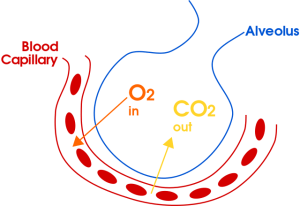 The matching of ventilation and perfusion is essential to achieve the adequate exchange of oxygen and carbon-dioxide within the alveoli. The V/Q ratio in normal individuals is around 0.8, but this ratio alters in the presence of significant ventilation or perfusion defects. Within lung, all the alveoli do not have uniform ventilation and perfusion. They tend to vary due to the effects of gravity. At the apex of lung, alveoli are large and completely inflated, while they are small at the bases. Similarly, the blood supply is more at the base of the lung than at the apex. This creates physiological ventilation (V) – perfusion (Q) mismatch between different alveoli. The decreased V/Q ratio (< 0.8) may occur either from decreased ventilation (airway or interstitial lung disease) or from over-perfusion. The blood is wasted in these cases and fails to properly oxygenate. In extreme conditions, when ventilation is significantly decreased and V/Q approaches to zero, it will behave as a pulmonary shunt. The increased V/Q ratio (> 0.8) usually occurs when perfusion is decreased (pulmonary embolism preventing the blood flow distal to obstruction) or over-ventilation. The air is wasted in these cases and is unable to diffuse within the blood. In extreme conditions, when perfusion is significantly decreased and V/Q approaches to 1, the alveoli will act as dead space and no diffusion of gases occur. Therefore the increased mismatch in ventilation and perfusion within the lung impairs the gas exchange processes and ultimately will lead to hypoxemia and respiratory failure. The decreased alveolar PAO2 will lead to decreased arterial PaO2 and hypoxemia but the A – a gradient remains normal as there is no defect within the gas exchange processes. In these conditions, supplementing with additional oxygen (increasing the FIO2) increases the PAO2 and corrects the hypoxemia. When a person suddenly ascends to the high attitude, the body responds to the hypoxemia by hyperventilation causing respiratory alkalosis. The concentrations of 2, 3-diphosphoglycerate (DPG) are increased, shifting the oxygen – hemoglobin dissociation curve to the right. Chronically, the acclimatization takes place and body responds by increasing the oxygen carrying capacity of the blood (polycythemia). The kidneys excrete bicarbonates and maintain the pH within normal limits. Shunt Decreased Increased Does not increase. 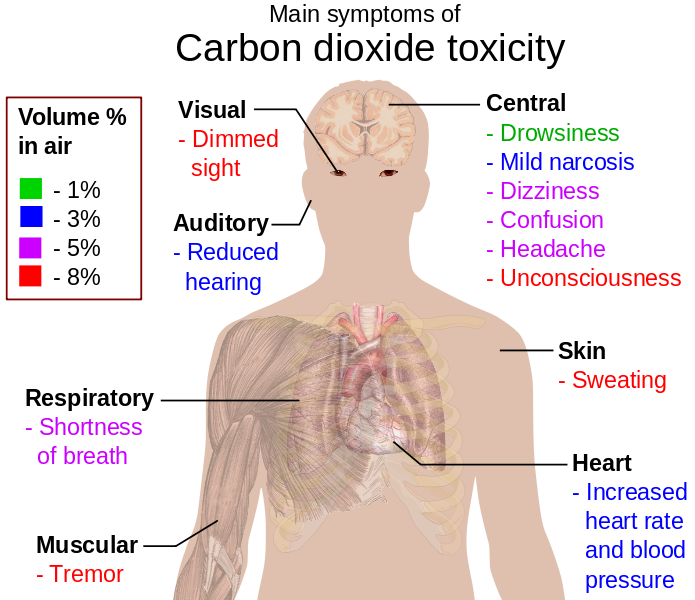 Hypercapnia occurs when carbon-dioxide tension (PCO2) increases to more than 50 mmHg. As explained above, at steady state, the rate of carbon dioxide production within the body the is constant. The PACO2 depends on and is inversely proportional to the ventilation, so decreased ventilation will cause increased PACO2 and vice versa. Therefore, hypercapnia (along with hypoxemia, Type II respiratory failure) occurs usually due to conditions that decrease the ventilation. Reduced central respiratory drive, e.g. opioid overdose, head injury. Upper airway obstruction (foreign body, edema, infection). Late severe acute asthma, COPD. Peripheral neuromuscular diseases, e.g. Guillain–Barre syndrome, myasthenia gravis, botulism. The patients with acute respiratory failure have an increased risk of hypoxic tissue damage and should be admitted to a respiratory/intensive care unit. The airway, breathing, and circulation (ABCs) are to be assessed and managed first, similar to all emergencies. The first goal in the management is to correct hypoxemia and/or prevent tissue hypoxia by maintaining an arterial oxygen tension (PaO2) of 60 mm Hg or arterial oxygen saturation (SaO2) greater than 90 %. It is usually achieved initially by providing supplemental oxygen and mechanical ventilation, which is provided by facial mask (non-invasive) or by tracheal intubation. The specific treatment of the respiratory failure depends on the underlying cause. Therefore, we should try to identify the underlying pathophysiologic disturbances that led to respiratory failure and correct it by providing the specific treatment. For example, steroids and bronchodilators for COPD and asthma, antibiotics for pneumonia, heparin for pulmonary embolism, etc. Increase PaO2: It is achieved by increasing the concentration of inhaled oxygen (FIO2) and positive end-expiratory pressure (PEEP). Decrease PaCO2. It is achieved by increasing the ventilation by adjusting the tidal volume and respiratory rate of the mechanical ventilators. Mechanical ventilation is also an appropriate therapy for respiratory muscle fatigue as it rests the respiratory muscles. 1. A 6-day-old neonate presents with severe shortness of breath and cyanosis. Vitals are RR 56, Pulse 158, BP 60/40, Temp 98ºF. Arterial blood gases reveal PaO2 55 mmHg, PaCO2 35 mmHg, pH 7.48. The A-a gradient is 47 mmHg. After giving 100 % of oxygen, the arterial blood gases are PaO2 58 mm Hg, PaCO2 35 mmHg, pH 7.47. What is the underlying pathophysiology of the hypoxemia? Which of the following should be done to increase the PCO2 and normalize the pH? 3. A 45-year-old male is admitted for severe shortness of breath. PaO2 is 59 mmHg. A ventilation-perfusion ratio has been ordered. Which of the following V/Q ratios indicate that the presence of pulmonary shunt? Walker BR, Colledge NR, Ralston SH, Penman ID. Davidsons Principles and Practice of Medicine. 22nd edition. Elsevier. pp 191-192. Kaynar AM. Respiratory Failure. [Date assessed: 10th March, 2016]. Feller-Kopman DJ. The Evaluation, Diagnosis, and Treatment of the Adult Patient with Acute Hypercapnic Respiratory Failure. [Date assessed: 10th March, 2016].